Can dogs eat pomegranate? Can pomegranate form part of a healthy dog food diet? Apart from having a terrific name, and for being rather delicious, I am happy to say that dogs are able to eat it. In fact pomegranate is one nutritious fruit. High in fiber, folic acid, vitamin C and potassium, pomegranate manages to be ultra high in antioxidants while low in calories. Ideal for us humans, is it the same for our dogs however? Unfortunately the high anti-oxidant property of pomegranate does not translate so well when used as a food for dogs. You can feed it to them, however their nervous system does not reap the benefits as we do. So while a small amount of pomegranate may make a good doggie treat if given conservatively, the benefits are minimum. Can dogs eat pomegranate – Any Precautions? On the flip side, you should take a minor level of caution when feeding your dog pomegranate. The fruit contains a high level of certain tannins, (the natural plant based anti-oxidant properties that make it so good for us), that in some instances can be troublesome for our dogs to consume. (For instance, acorns have a high level of tannin toxicity in the form of Gallontannin and this is a big no, no for canines). If this happens your dog may experience stomach ache and diarrhea. Your dog may also vomit however this is actually a preferred negative reaction, as by doing this, the dog is rejecting what they are not able to break down. It is never pleasant to see our dogs retch, however it is the body’s best method of dealing with any disagreeable substances. Again, such reaction is rare and should not occur if you mind to feed your dog only a small amount of the fruit that very first time. So what about the seeds? In the majority of seeded fruits, (pears, apples, grapes to name just three), the seeds contain a small amount of cyanide. Cyanide is actually toxic to both humans and dogs, however canines need a much smaller dose in their dog food in order to cause complication. Fortunately pomegranate seeds do not contain cyanide. The seeds, called arils are actually edible and make up a large part of the fruit. Containing lots of juice the arils can be munched on or spat out depending on personal (or doggie) preference. 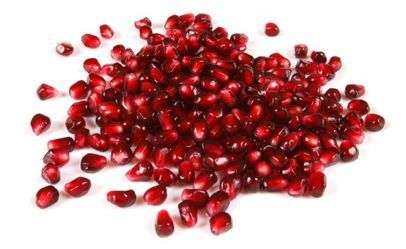 Pomegranate can be added to dog food with out any issue. However, it should be in small amounts to ensure that the fruit does not disagree with them, and you need to bare in mind that the nutritional benefits that you or I would get from eating this fresh little delight does not translate so well to your pooch. If you have any comments on your own experiences with feeding your dog pomegranate please leave them below.